When Bay Area artist Lea Redmond, known for running the “World’s Smallest Post Service,” stumbled across Parlor Coo Coo on eBay, she knew she’d found something special. 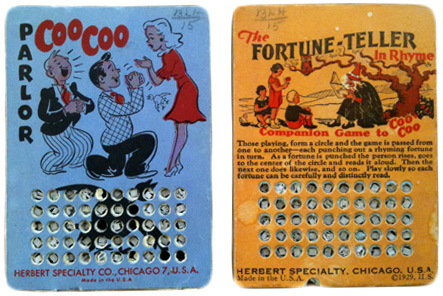 Sure enough, handheld punch-board parlor games, like Coo Coo and its companion The Fortune-Teller in Rhymes, were the icebreakers du jour at cocktail parties of the 1920s and ’30s. But the origins of these pre-smartphone amusements are not so cutesy. First designed for gambling, punch boards quickly became the go-to scam for gangsters and mobsters like Jack Ruby, con artists, and lottery operators hoping to swindle the gullible. We found a thorough history of the parlor games’ less-than-savory past at Punchboard.com. Their story goes back to 18th-century America, when lotteries were the new rage. In those days, lotteries needed a substantial number of participants, until a clever tavern owner figured out way to host a lottery for even just one customer. He built a lottery game board out of wood (the original was probably eight inches square and half an inch thick), drilled holes in it, and stuffed each hole with a paper slip printed with a number or symbol. Then, or so it’s surmised, he posted a sign boasting a chance at cash prizes for the price of a penny. A customer could push out a slip of paper with a nail, and check to see if he had the winning number. These games spread across the country, but in the early 19th century, gamblers grew wary of them. They had figured out that barkeeps, who usually made their own boards, often kept the top prizes for themselves. Because they knew where the winning numbers were, the owners would push out that slips and claim the prize had been won by a random customer. Some just didn’t bother to include a winning number in the first place. Punch boards made a comeback during the Industrial Revolution, when they could be manufactured with paper or foil covering the holes on both sides—in theory, this technology should have prevented the operators from rigging the games. This new generation of boards came with a metal “punch” for gamblers to push out the tickets. By 1910, these games were so inexpensive to produce, they sprang up everywhere. In fact, these were the predecessors to modern-day lottery scratch cards, as well as “The Price Is Right” game Punch-A-Board. Bingo was also often played on punch boards. The games were also adopted by mobsters like Jack Ruby, also known as the man who murdered Lee Harvey Oswald. 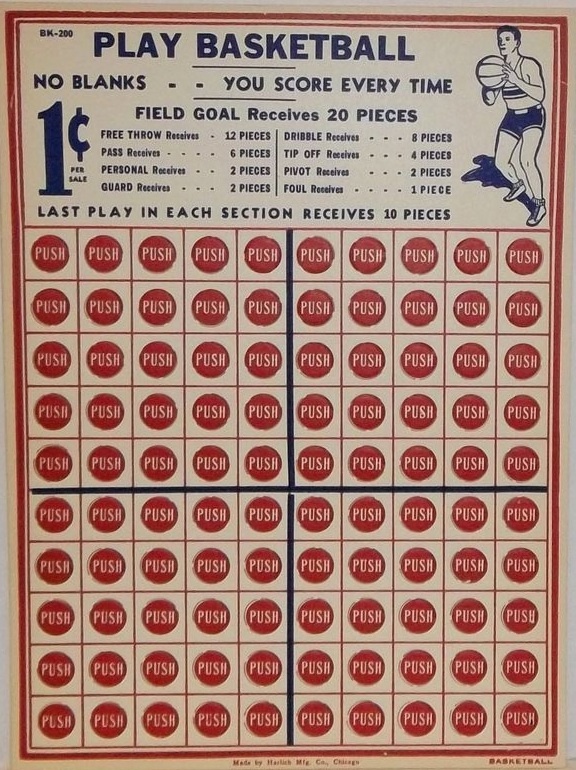 While some manufacturers produced punch boards with as many as 10,000 holes, earnestly placing the prizes in random locations, others designed by the gambling industry sold “keyed” punch boards that came with a map indicating the locations of the winning tickets. Those were popular with con men, like the character played by George C. Scott in the movie “The Flim Flam Man,” who sold boards to bar owners for less than their market value, kept the maps for himself, and then enlisted an accomplice to go bar-hopping and win all the cash prizes. 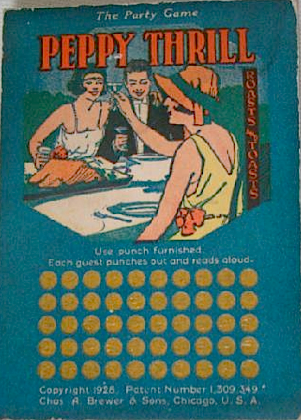 Punch boards reached their height of popularity in 1939, when more than 50 million were produced. Thanks to all the criminal activity around them, by World War II the games were banned in several U.S. states. To hide the true purpose of these boards, many manufacturers labeled them “for trade only,” claiming the tickets were not redeemable for cash (even though they were). 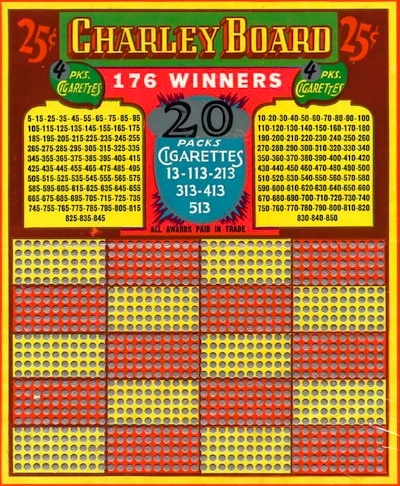 Tobacco and beer companies would use boards to advertise their products, suggesting you could win a beer or a cigar, but these, too, were used for cash gambling. Zippo was particularly successfully using these gambling tools as advertisements, selling around 300,000 lighters through punch boards. Like modern-day slot machines, punch boards often had themes and were decorated with images of sports or folk heroes like Paul Bunyan. During World War II, punch boards that let you pretend to take a crack at Hitler were common. 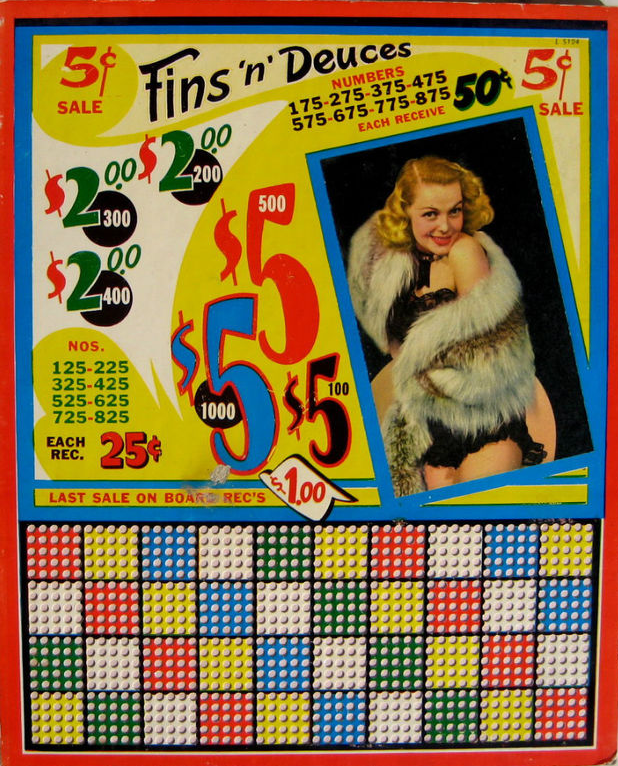 The most popular theme was what’s known as a “pin-up punch board,” which featured an image of a comely young woman. Some had suggestive names, like “Pick a Cherry” or “Hit Me Take Me.” Jim Linderman at Vintage Sleaze even found a punch board advertising “mystic” girlie glasses, which were drinking glasses that featured a pin-up who appeared to strip naked when the beer was poured in. 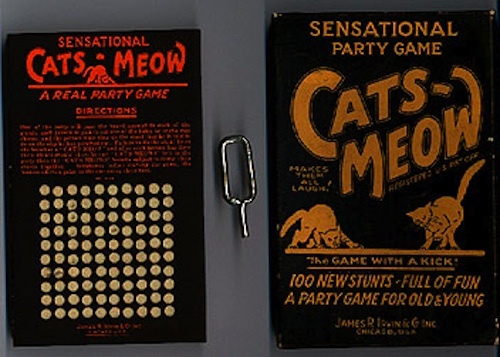 Although punch boards promising cash prizes thrived in bars, casinos, and mobster-run joints, as Lea Redmond discovered, handheld punch-board parlor games of the era—with names like Cats-Meow, Peppy Punch-It Parlor Ranks, Prof. Bunken, Phony Fibs, Kissing Game, and Dippy Parlor Game Charades—offered much more innocent diversions for the home, until they disappeared amid the anti-gambling fervor. Delighted by these long-lost amusements, Redmond decided to create her own. 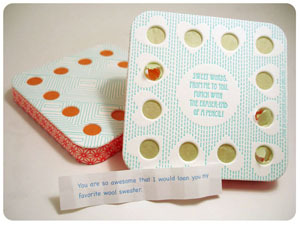 Available at Leafcutter Designs, Redmond’s Retro Punch Boxes are conceived as Valentines—suitable for friends, family, or the object of your romantic fancy—each stuffed with 12 hand-scrolled paper slips, printed with “Sweet Words” such as “You are so awesome that I would loan you my favorite wool sweater.” For a little bit extra, you can compose your own punch-box messages for your sweetheart. Even though these gentle Valentines may seem far removed from the punch board’s seedy back-room roots, it seems appropriate. After all, what is love if not a gamble? ARE THESE PUNCH BOARDS LEGAL IN FLORIDA ? CAN THEY BE BOUGHT I LARGE QUANITIES? DO THEY MAKE BOARDS THAT COST MORE TO PLAY? IF SO WHERE ? CAN YOU FIND A KEY THAT WILL TELL YOU WHERE THE WINNERS ARE ? “ ” If you wore enough sequins, you became something of a human disco ball yourself.